"I cry in a loud voice. I listen to my mind but can not decipher the deep words. With flying arms I will go on from noon dream. 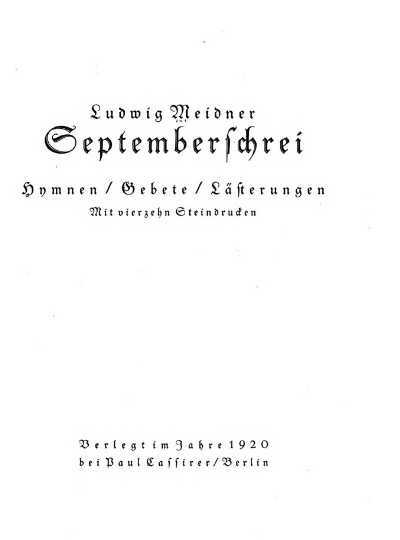 ...” Ludwig Meidner, Septemberschrei. A beautiful copy of Ludwig Meidner’s Septemberschrei has come to market. With only 100 copies printed, it has become quite rare; the book is being offered for $7,500. "The manner in which many of us lived and worked before the war was not right...What we need for the future, all of us, is a fanatic, fervent naturalism; oh, a passionate, virile, and unflinching veracity, like that of Masters Multscher, Grünewald, Bosch, and Breughel...our visions must be articulated as clearly and powerfully as those of Multscher and Grünewald...let us always think of these two! And let us not forget the noble, reliable, prudent craft of these heroes...Yes, craft - precious, laborious craft - which has its own severe beauty! All too frequently we have been remote from our world. Our desired goal was a geometric formulation, and the most advanced artists in particular obsessively strove for abstraction and concrete art. All you painters with your heads in the clouds, you want to forget the earth and to squeeze the spirit pure and immaterial directly out of your tubes of paint. But behold for just a moment the glorious reality of things...Let us hold fast to the earth, lest we end up in the boundlessness of the wild blue yonder. Let us return to a passionate realism, to a deep, loving faith in the physical reality of the world." The figures in the lithographs of September Cry are seers of a new future yet “the fourteen lithographs of prophets that accompany his text, however, were still representative of his ecstatic style. Meidner's quest for for a 'fanatic naturalism' was undertaken in in the 415 intaglio prints that he produced between 1919 and 1922. While some painters studied Max Doerter's painting manual in order to develop beyond Expressionist formalism, Meidner undertook a study of the graphic techniques of artists like Dürer and Rembrandt" (Crockett, German Post-Expressionism: The Art of the Great Disorder 1918-1924, pp. 62-63). The prophets of Septemberschrei are all in the image of Meidner, who was as obsessed with self-portrait as Rembrandt. “After [Oskar] Kokoschka, it is to Meidner that we owe the most important portraits of the generation of Expressionist writers, to which he himself - by virtue in particular of his books Im Nacken des Sternemeer (Behind One the Sea of Stars,’ 1918) and Septemberschrei (September Cry, 1920) - very much belongs. These works are personal admissions, clothed in expressive vernal formulas, ‘ardent confessions, stammering transports of an ecstatic man...’ The drawings [in Septemberschrei] display the whole panorama of the features that characterize Meidner” (Lang). Meidner’s reactionary stance against Expressionism was not welcome in all quarters. Expressionism was considered the only approach that could capture the essential truth of reality in the twentieth century, a hard, urban, cynical, mechanistic, inhuman world that no amount of wishful thinking could erase. Critic Wilhelm Hausenstein decried "the shamelessness of...the neo-naturalistic baroque-naturalistic vehemence of Meidner" (Hausenstein, Die Kunst in diesem Augenblick, as cited by Crockett, p. 22). Meidner’s highly emotional flood was an embarrassment and insult. The extreme intensity of experience that Meidner expressed was, for some, too much, as if, in his shock, the war had loosed an avenging, apocalyptic angel of the arts, a Christ-figure in the wilderness struggling with the devil, shouting to God, seeking a true path out of the wasteland and to the Sermon of the Mount. It is axiomatic that after a cataclysm a society will question everything that led up to it. The war had changed everything; to ignore the horror and return to business as antebellum usual was strictly for ostriches. These neo-naturalist artists and writers were birds of a different feather altogether, with eyes wide-open to keenly see that a world turned upside-down was not about to turn right-side up again, that, indeed, right-side up had been the wrong side up to begin with. The nineteenth century was now officially dead and buried, the millions who died during the war littering its corpse. But to throw the beauty of the natural world, however ugly, out with the bloody bathwater was immoral. Meidner fled Germany in 1935. Though his rejection of abstraction in the arts would, theoretically, find sympathy with the Nazis, the idealized beauty that Hitler embraced and mythologized was not for Meidner, who sought and found the lyric bloom in the ugly truths of the real world. And, too, Jews were, by 1935, persona non grata, a grim reality that was a bit too earthy, even for Meidner, whose ecstasy transported him out of Germany before the Nazi Ministry of Transport transported him to Dachau et al and a most unnatural death. MEIDNER, Ludwig. Septemberschrei. Hymnen, Gebete, Lästerungen. Berlin: Paul Cassirer, 1920. Vorzugsausgabe (Special Edition), one of 100 hand-numbered copies on handmade Van Geldern-Bütten paper, with all fourteen lithographs signed in pencil by Meidner in the margin. Large quarto. (2), 75, (5) pp. fourteen original lithographs hors texte, lithographs hand-printed by Pan-Press. In the publisher’s deluxe binding of quarter vellum over patterned brown paper over boards. Lang 234, p. 54; Jentsch 88; Rifkind/Davis p. 528f. ; Raabe/Hannich-Bode 203.2. Images courtesy of Ars Libri Ltd., with our thanks.